Daniel faced the overwhelming task of choosing a career after high school graduation. He was one of many students in the United States representing the first in their family to graduate high school. While working a job and passing his tests, this decision stayed prominently on his mind. However, he was not alone in this process. 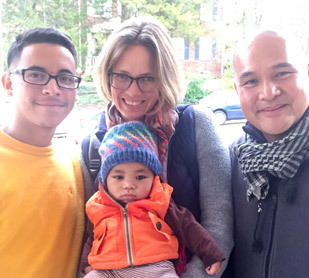 At his side have been his supportive family and his two Casa mentors Sarah and Emmanuel. Arriving to this point was one of many milestones in their journey together. Casa Chirilagua’s mentoring program goal is for two lives to be transformed through one mentorship. However, in their case, it has brought transformation to many more than that. Later, Daniel saw how Sarah and Emmanuel’s relationship with his mother Julisa developed. Their bond was strengthened as the couple sat with Daniel and Julisa to speak about the high schooler’s options after graduation. Julisa ultimately wanted him to pick a career path that made Daniel feel confident. After thorough guidance from Sarah and Emmanuel, Daniel felt it was the right decision to enter an apprenticeship program after high school. Through their coaching, Daniel felt a giant weight lifted off his shoulders as he faced this new challenge with more clarity. As they close their final year in the Mentoring Program, the Pimentel’s mention their relationship with Daniel and his family won’t end. Instead, it is only the beginning of a new stage in his young adult life. January is National #MentoringMonth. To learn more about becoming a mentor with Casa Chirilagua, visit our mentoring page!